In this video we will discuss nesting angular components i.e including a component inside another component. This is continuation to Part 5, please watch Part 5 from Angular 2 tutorial before proceeding. As we already know Angular 2 is all about components. A component in Angular allows us to create a reusable UI widget. A component can be used by any other component. Let's look at a simple example of nesting a component inside another component. Here is what we want to do. 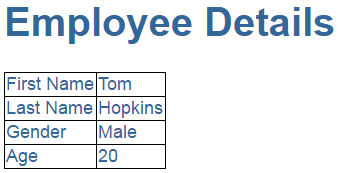 Create a page that displays Employee details as shown below. Step 1 : Right click on the "App" folder and add a new folder. Name it "employee". We will create our EmployeeComponent in this folder. Step 2 : Right click on the "employee" folder and add a new HTML page. Name it employee.component.html. Copy and paste the following HTML. Step 3 : Right click on the "employee" folder and add a new TypeScript file. Name it employee.component.ts. Copy and paste the following code in it. At this point we have our child component EmployeeComponent created. Next let's create the root component - AppComponent. Step 4 : We are going to use the root component to just display the page header. So in "app.component.ts" file, include the following code. Notice, since the View Template HTML is just 3 lines we have used an inline template instead of an external template. Angular2 recommends to extract templates into a separate file, if the view template is longer than 3 lines. At this point if we run the application, we only see the page header - "Employee Details", but not the table which has the employee details. To be able to display employee details table along with the page header, we will have to nest EmployeeComponent inside AppComponent. There are 2 simple steps to achieve this. Step 1 : In "app.module.ts" file we need to do 2 things as shown below. AppModule is the root module which bootstraps and launches the angular application. You can name it anything you want, but by convention it is named AppModule. BrowserModule - Every application that runs in a browser needs this module. In a later video in this course we will discuss NgIf and NgFor directives which are also provided by this module. NgModule - @component decorator adds metadata to an angular component class, similarly @NgModule decorator adds metadata to the angular module class. In Part 4 of this tutorial, we discussed that if a class is decorated @component decorator then that class becomes an angular component. Similarly if a a class is decorated with @NgModule decorator then that class becomes an angular module. 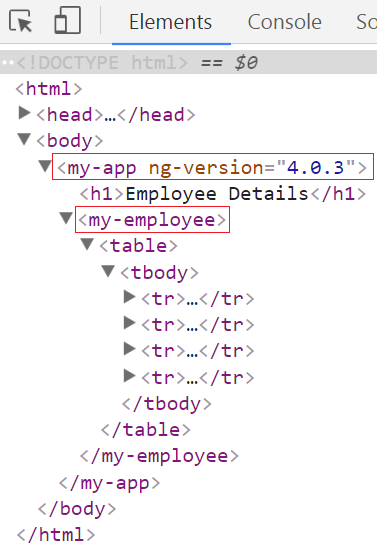 Step 2 : In "app.component.ts" file include "my-employee" as a directive. 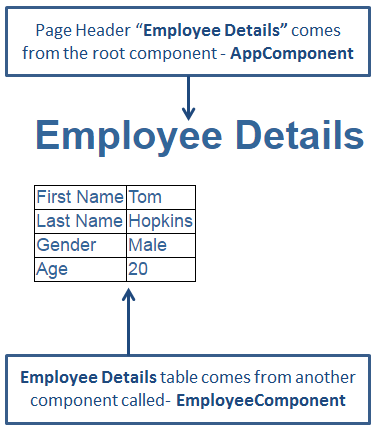 Remember in "employee.component.ts" file we used "my-employee" as a selector. Run the application and you will see both page header and the employee details table. The employee details table is not styled very well. To style the table, include the following styles for <td> and <table> elements in styles.css file. Run the application and you will now see the employee details table with the specified styles applied. At this point, launch browser developers tools and click on the "Elements" tab and notice <my-app> and <my-employee> directives in the rendered HTML. above code is fine . But what if I want to show some more components in the same page like department details, employee Salary details section . I am not able to see the new styles on the table. Please suggest what could be the problem. @Ankit Shivhare, Deleting browser cache and reloading the page helped me to solve this issue. The browser is rendering the older css file. Ctrl + F5 on browser should do the trick. Thanks above solution worked for me. why angular 2 is caching again and again. First all Thanks for your Lectures. I have followed each and every step everything going fine with CLI but then i followed each and every thing of the lecture to run angular from f5 i am getting errors when i rebuild the solution but if i press to run with errors everything working fine as there is no error in browser console but in vs 2017 console there are 3 errors. i don't know why that errors are coming. please share you email address so that i can share the image of error i am getting. Add the below property into your tsconfig.json file.